I think we can all agree that pancakes make the world a happier place. 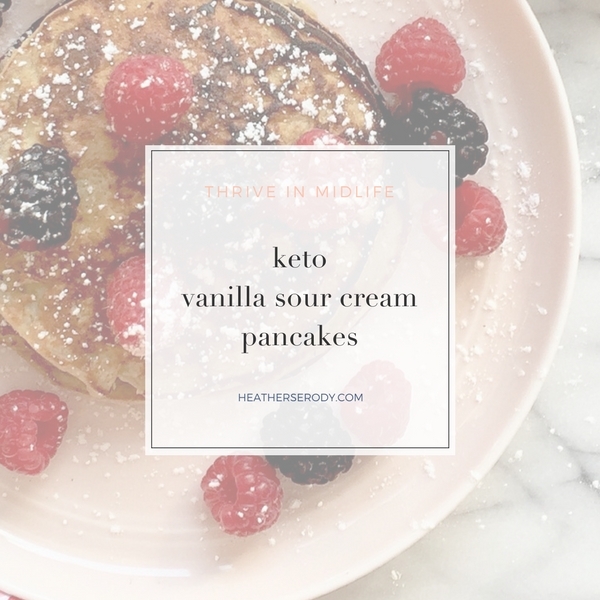 Even if you're eating ketogenic, you can have yummy pancakes, too. A recent comment disputing the carb counts of the ingredients inspired a total overhaul of this recipe. I've noticed that when my clients eat too much almond flour or coconut flour they stall in weight loss and get kicked out of ketosis, so I'm trying to do away with them as much as possible. I've been replacing those keto flours with ground pork rinds. Before you protest, let me just say, don't knock it until you try it. Pork rind dust is just plain pork rinds ground fine in the food processor so that they resemble breadcrumbs. They have zero carbs & lots of protein. I don't know why, but for some reason, when you cook pork dust it loses it pork rind flavor and becomes very neutral tasting. It's perfect for pancakes. 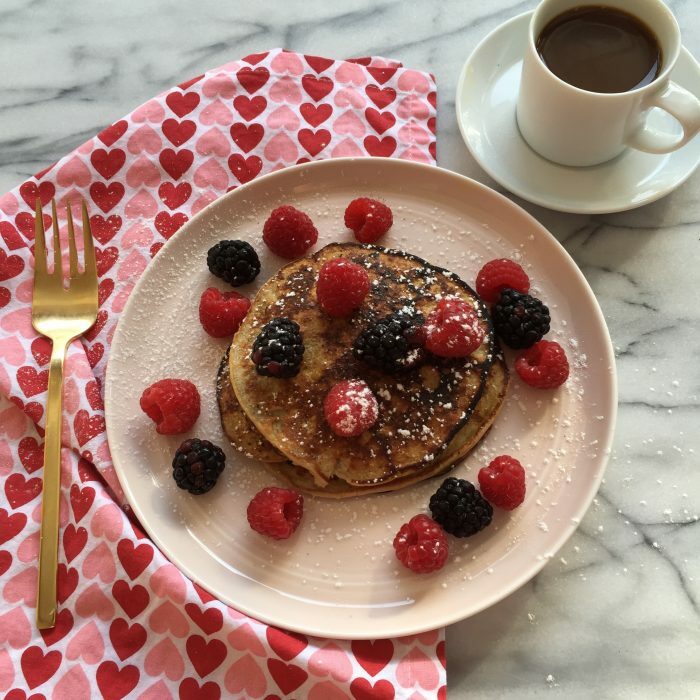 The pancakes have several ingredients that are vanilla flavored, and thanks to a touch of stevia glycinate, they are perfectly sweetened. I happily eat them hot from the pan without syrup. 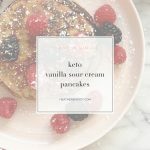 But if you do want syrup, try my stupidly simple keto maple syrup. Stock up on these special ingredients ahead of making your pancakes. I like to make a triple batch and freeze them in individual portions for easy weekday breakfasts for my boys. Preheat a large griddle/cast iron pan to medium heat. Add protein powder, pork dust, & baking powder dry ingredients to a medium sized bowl & wisk together to combine. Add the sour cream, egg, almond milk, vanilla extract & stevia to the bowl and whisk until well combined. add a bit more almond milk if needed to thin batter. Grease pan with butter or ghee and drop batter into pan using a 1/4 C measuring cup. Flip pancakes when there are holes all over the top. Cook for an additional 1 minute ir until the bottom is nice and browned. Repeat until batter is used up. Serve hot. To freeze, allow pancakes to cool completely before wrapping with plastic wrap and storing in freezer. To reheat, pop in toaster. Optional: Serve with Keto-approved syrup & or whipped cream & berries. Nutritional information is, of course, an estimate. Calories, fat, carbs, and protein counts vary by brand. I do due diligence in calculating macros by the product nutritional information, the My Fitness Pal database, and sometimes the U.S. government food database or a combination of all three. If you use different ingredients or brands, of course, know that your macros will differ. One 5.5 oz bag of Mambi pork rinds yields 1.5 cups of pork rind breadcrumbs. From the nutritional information on the bag, it follows that 3/4 C of pork rinds contains 320 calories, 20 g fat, 0 carbs, & 36 grams protein and also weighs about 50 grams.